As a prerequisite to the UT full-stack development bootcamp I will be diving into this summer, I was encourage to go through a basic CS 101 class and I chose one offered by Stanford University online and taught by Nick Parlante. It is a basic course that does a great job of introducing various topics like RGB values, the 'for' loop, the 'if' statement and what/how a computer is and works on a basic level. As someone who historically and who continues to ponder the origins of things this course was a great primer into the world of computer science. The class is free, self-paced and great for anyone with the slightest interest in computers. I would recommend looking into it. You can register here Stanford University Online Courses-CS101. "A computer is a general purpose device that can be programmed to carry out a set of arithmetic or logical operations automatically." 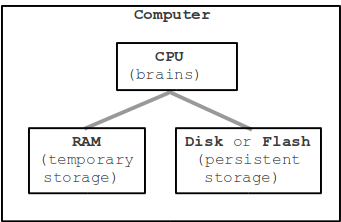 There are three major parts to a computer: CPU, RAM and Persistent Storage. While bites are the smallest measurement of storage the most common measure of storage are Bytes and are made up of 8 Bits. eg. 0 1 0 1 1 0 0 1. One byte is is large enough to store a single letter like 'b'. Some common file sizes that you will see are MB or MEGABYTES which is roughly 1 million bytes and GB or GIGABYTES which is roughly 1 billion bytes. Now that the foundation has been set with hardware on to the programs that we use every day, also knows as software. 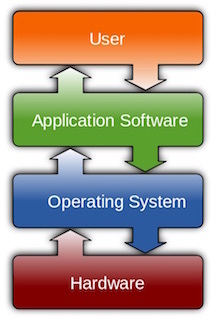 Basically, software is an enormous sequence of computer instructions or data that the CPU (hardware) runs. When a program is opened it is loaded into the RAM and then the CPU runs the machine code. The picture below courtesy of Wikipedia shows how a user interacts with the computer and software. The above is a very quick and basic overview of some of the important pieces that make up a computer. However given that I am new to this I hope what I have covered is sufficient at least for the time being. The myth is that computers are extremely intelligent but the truth is they are not actually very smart. They are only as smart as humans program them to be. The one thing they can do that humans can't is perform millions of tasks instantly. It is humans that give computers their power and we should seek to use it as a tool to enhance our daily lives. Check out this video on Paul Ford's Bloomberg article "What is Code?" that summarizes nicely what a computer is.